With that in mind, we've assembled a list of 10 key indicators when analyzing your personal website to determine whether or not you might be due for an update. Let's get started. Integration of social media into his or her personal website is a sure sign that an loan officer is on the cutting edge of technology. Does your site include links to all of your social media accounts, such as Facebook, Twitter and LinkedIn? Some loan officers may be afraid of this new technology, but it can't be dismissed as a trendy marketing gimmick. Not only are social media platforms a great way to establish relationships with potential clients before they need your services, but integration of your social media accounts can be highly beneficial to your search engine optimization. The more you can integrate social media into your site, the more it will provide the valuable "new content" that leads to high rankings in search engines. With its relationship-building capabilities and search engine benefits, it's important that you integrate your social networking sites into your own personal website. Branding is all about creating an emotional response in your target. Far too often, however, loan officers fail to convey their personal brand on their website. Branding is more than just a catchy slogan. It's a gut feeling created in the consumer that either attracts them to you or repels them from you. You want visitors to your website to come away with something memorable and a feeling that they know you and would feel comfortable working with you. And oh yeah - you only have a few seconds to capture their attention while they're quickly making decisions about whether or not they'd ever call you. 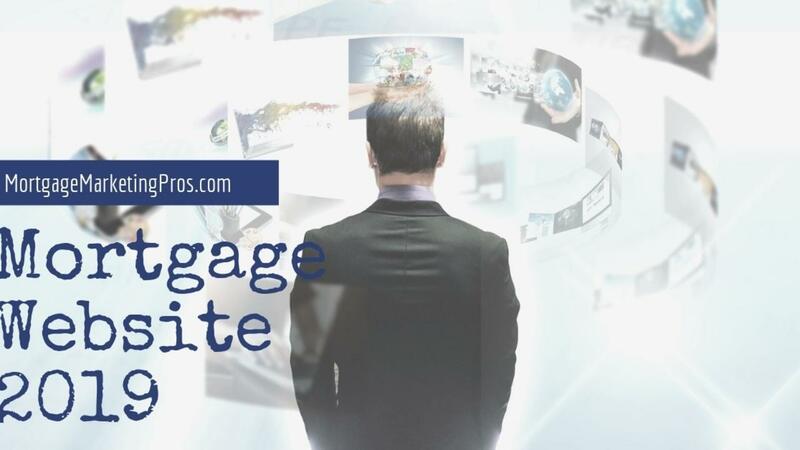 As home buyers and sellers use the web more and more as a screening device in selecting an loan officer, the more important it becomes that your website conveys your unique personal brand. For better or worse, people are going to make the decision whether or not to call you based on their perception of you that they get from your website. So it's time to take a long, hard look at your site and ask yourself the following questions: How will visitors to your site come away thinking about you? What will be their first impression? What emotional response will they have to your site? Does your website differentiate you from other loan officers? Does it convey a sense of high quality? Does it give insight into who you are, or does it read like generic information that could apply to any loan officer? If your site isn't doing a good job answering these questions satisfactorily, it's time to consider making a change to your website. Continuity of message and your look is an important element in building a personal brand. Here's an exercise to help determine if you've achieved continuity in your marketing. Just play along and imagine this scenario for a second: Let's say a homeowner logs on to your personal website, but for the purposes of this experiment, your name is concealed from their view. Would they recognize you simply from the aesthetic design of your site? If not, that's a big problem. It's very important that all of your marketing efforts provide a consistent look and feel, regardless of the medium. That means that anything and everything you do - direct mail, fliers, handouts AND your website - should have a consistent, instantly recognizable look. In the simplest terms, the point of marketing is to create a perception in people's minds that makes you memorable to them. So if that's your goal, it only makes sense to help make yourself memorable by having a consistent look across everything you do. This seems like an obvious point, but we're continually amazed at how many loan officers tend to underestimate the importance of continuity across all of their personal marketing efforts. Too many loan officers opt for the "cheapie" one-size-fits-all, template site. In doing so, they might save a few pennies up front, but they are costing themselves thousands of dollars in potential lost opportunity. If your site doesn't match the look of your other marketing activities, it's time to make a change. It's a fairly impressive accomplishment just to get a prospective client to visit your website. But just visiting your site isn't the reason you have a website. It's all about converting those visitors into leads, and far too many of the sites we see don't give the visitor ample opportunities to do so. The best mortgage websites include what the industry calls "stickiness." Stickiness is all about giving the visitor a reason to come back to your site or to bookmark it for repeated visits in the future. To achieve stickiness, you need to be providing valuable content to the reader. The key to doing this is to step outside your view and put yourself in the prospective home buyer or seller's shoes. You need to think like your customers. You need to provide market-specific information. You need to ask yourself what questions people are asking you, and then offer that information on your website. It's also essential that you have a system and technology in place to compel visitors to sign up and give you their information. From special report offers to periodic market update requests and more, effective lead-capture tactics are essential to making your website a strong business generator. If you don't have them, you're falling behind the pace. Even once you have a way of capturing people's information, the game is not over. At that point, it becomes essential that you have a foolproof follow-up system to keep in touch these prospective clients. The key is to maintain a consistent, but not overbearing presence in their lives. After initial contact and lead qualification, a maintenance follow-up of one to two emails a month is a good plan. Far too many loan officer sites seem to be based on the belief that "more is always better." You've seen 'em - the sites that are a dizzying array of useless links and widgets that make your eyes glaze over as soon as the home page loads. On the other hand, the best sites are those with simple, clean navigation that deliver content people actually want and provides value. If your site is packed full of miscellaneous links and flashing buttons, it's time to tone it down and create an easy-to-navigate site that puts the emphasis where it belongs - on conveying your personal brand and delivering valuable, relevant content to your visitors. We'd be remiss if we wrote an article about marketing on the web and didn't mention blogging. Over the last couple years, there are few topics we have been asked about as much as blogging. So here's the scoop: Blogging is great, but it also contains a huge pitfall. The upside of blogging is that it allows you to periodically provide valuable information to people in an unobtrusive way. Through regular blogging, people will grow to like you and feel comfortable with you. Consistent blog updates will also increase your search engine rankings. We can hear you now. "That sounds great! So what's the drawback?" The drawback of blogging is that it's very easy to get excited about blogging when you first become a blogger. The first couple weeks, it's an inspiring part of your daily activities. But inevitably, the appeal of writing a new blog entry is going to wane. And the lower your enthusiasm for blogging becomes, the less likely you are to regularly update your blog. This becomes a problem when visitors to your site click on your blog. If you haven't updated it recently, the immediate impression is that you are not on top of things. You're perceived as being out of touch, or too busy, or worse yet, possibly out of the business. So the key to blogging effectively is much like the key to keeping your entire marketing campaign on track - systematization. If you are committed to regularly updating your blog, and you have the content to do so, then go ahead and start a blog. But be forewarned - your commitment to updating your blog must be as strong as any commitment in your business, or you run the risk of having your blog ultimately do more harm than good. Getting those coveted high rankings in the search engines isn't something that happens by chance. Search engine optimization is a blend of science and art. It's about understanding how things work on the Internet as well as understanding what people are looking for and their search tendencies. The best mortgage websites are those that include search engine optimized copywriting, are updated with new content frequently and regularly, and contain the tools and information that home buyers and sellers are looking for. To that end, it's critical that your site properly integrates the most-searched-for keywords in order to generate more traffic to your site. Search engines aren't just about keywords, however. It's also important to post new content to your site on a regular basis, because the search engines will downgrade your ranking if your site is perceived as being inactive or static for long periods of time. Links to your site from other sites are also highly beneficial your ranking in the search engines. Long story short, search engine optimization can play a vital role in your website's success. To fully maximize your web presence, you have three basic choices - study all you can and become a search engine optimization expert and improve your rankings through a systematic organic SEO plan, or hire someone an expert to handle your SEO for you. Or you can consider pay per click search engine marketing- paying to have your site appear at the top of a search engine's rankings for specific chosen keywords. Many older and template-based sites we see often display broken links, missing files and disheveled elements that immediately cast doubt on the loan officer's professionalism. In this day and age, it's not enough to simply "have" a website anymore. You need to continually hone your site and monitor it to ensure everything is in working order and providing the most value possible to your visitors. There's no doubt the web is primarily a visual medium. But that doesn't mean that the copywriting doesn't matter. There are different camps on this, some feel copywriting is not as relevant in today's short attention span world or in Web 2.0 websites. A quick survey of most loan officer sites tells us most loan officers underestimate the importance of well-written copy throughout their site. This is not a job for you, the loan officer. It's something that should be handled by professionals, or else you run a serious risk of looking unprofessional to the home buyers and sellers visiting your site. A poorly written sentence here; a typo or spelling error there, and suddenly you start to de-sell yourself. The moral of the story: Don't try to do things that aren't within your expertise. You sell houses. Professional copywriters write website marketing copy. To maximize the effectiveness of your site, keep it that way. 10. When Was Your Last Site Review? Websites can be thought of like clothes. When you first buy it, it's in style, up-to-date with the trends and makes you look good. But styles change quickly, and just like that shirt you bought a couple years ago, a website can age quickly. If you have a plug and play website or set up a custom site more than two or three (scary!) years ago, it's time to give your site a thorough review. Updating your photos is the bare minimum, and you'll likely find that many of the elements we discussed in this article are lacking from your site. Your website can be a huge boost to your business and an excellent lead generator. On the other hand, it can send a signal that you're a fairly inactive loan officer who doesn't keep up with the latest trends - and by extension, is probably out of touch with current market conditions and home values. In other words, not a wise choice to handle one of the largest investments most people make. The beauty is the way you're perceived is entirely up to you and you can upgrade your site with a website refresh. You can leave it alone and hope for the best, or you can actively "work" your site to make it as strong as can be. Need a New a Website or Ready to Re-Design your current website? Click on the following link to contact us.